This article is about the planet. For other uses, see Venus (disambiguation). Venus is the second planet from the sun. It has a day longer than a year. The year length of Venus is 225 Earth days. The day length of Venus is 243 Earth days. It is a terrestrial planet because it has a solid, rocky surface like other planets in the inner solar system. Astronomers have known Venus for thousands of years. The ancient Romans named it after their goddess Venus. Venus is the brightest thing in the night sky except for the Moon. It is sometimes called the morning star or the evening star as at some elongations it is easily seen just before the sun comes up in the morning and, at other elongations, just after the sun goes down in the evening. Venus comes closer to the Earth than any other planet does. Venus is sometimes called the sister planet of Earth as they are quite similar in size and gravity. In other ways the planets are very different. Venus' atmosphere (air) is mostly carbon dioxide with clouds of sulphuric acid. Sulphuric acid is a chemical that is very poisonous to humans. The thick atmosphere has made it hard to see the surface, and until the twenty-first century many people thought things might live there. The pressure on Venus' surface is 92 times that of Earth. Venus has no moons. Venus spins very slowly on its axis and it spins in the opposite direction to the other planets. Venus is a terrestrial planet so, like the Earth, its surface is made of rock. Venus is much hotter than Earth. All the carbon dioxide in the atmosphere acts like a blanket, trapping heat from the Sun. This effect is called the greenhouse effect and it is very strong on Venus. 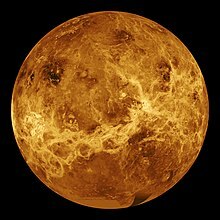 This makes the surface of Venus the hottest of any planet's surface in the Solar System with an estimated average temperature of 480 °C (896.0 °F). This is hot enough to melt lead or zinc. Venus has no oceans because it is much too hot for water. Venus' surface is a dry desert. Because of the clouds, only radar can map the surface. It is about 80% smooth, rocky plains, made mostly of basalt. Two higher areas called continents make up the north and south of the planet. The north is called Ishtar Terra and the south is called Aphrodite Terra. They are named after the Babylonian and Greek goddesses of love. Venus' atmosphere is mostly carbon dioxide and nitrogen gas with clouds of sulphuric acid. Because the atmosphere is so thick or dense the pressure is very high. The pressure is 92 times the pressure on Earth, enough to crush many things. It is impossible to see the planet's surface from space as the thick cloud layer reflects 60% of the light that hits it. The only way scientists are able to see it is by using infrared and ultraviolet cameras and radar. Venus can sometimes be seen passing between the sun and earth. Venus looks like a black dot when seen through a special telescope. These passages are called "transits". These "transits" happen in pairs eight years apart. Then it's more than a hundred years to the next pair. ↑ 1.0 1.1 1.2 1.3 1.4 Williams, David R. (April 15, 2005). "Venus Fact Sheet". NASA. Retrieved 2007-10-12. ↑ Harvey, Samantha (2011-02-16). "NASA: Solar System Exploration: Planets: Venus: Moons". NASA. Retrieved 2011-03-31. ↑ Seidelmann, P. Kenneth; Archinal, B. A.; A’hearn, M. F.; et al. (2007). "Report of the IAU/IAGWorking Group on cartographic coordinates and rotational elements: 2006". Celestial Mechanics and Dynamical Astronomy 90: 155–180. doi:10.1007/s10569-007-9072-y. http://adsabs.harvard.edu/doi/10.1007/s10569-007-9072-y. Retrieved 2007-08-28. ↑ Espenak, Fred (1996). "Venus: Twelve year planetary ephemeris, 1995–2006". NASA Reference Publication 1349. NASA/Goddard Space Flight Center. Retrieved 2006-06-20. ↑ "Venus: Facts & Figures". NASA. Retrieved 2007-04-12. ↑ "Space Topics: Compare the Planets: Mercury, Venus, Earth, The Moon, and Mars". Planetary Society. Retrieved 2007-04-12. ↑ "The Atmosphere of Venus". ↑ "Venus - an overview". ↑ "Temperature on the Surface of Venus". This page was last changed on 22 March 2019, at 03:51.